The Electrisave Wireless Electricity Monitor is an award-winning portable device used to display the amount of electricity you are using, and how much it is costing you. Knowing how much electricity you are using is the first step to finding ways to reduce consumption. Installation of an Electrisave is very simple. A small current sensor is clipped onto the existing electricity meter cabling with no need for the assistance of an electrician. 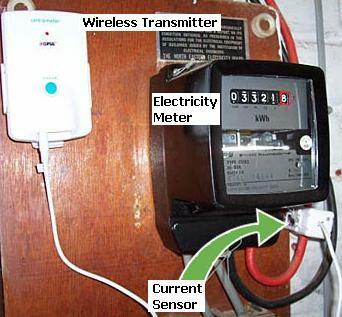 This sensor sends data down a wire to a battery powered (3xAA alkaline batteries included) wireless transmitter which remains next to the electricity meter. It can be fitted to the wall using the included wall bracket. The remote transmitter sends data to the battery powered wireless display unit (3xAA alkaline batteries included) where the amount of electricity used, the cost of electricity used, and the amount of CO2 emitted is shown. The portable display unit can be moved from room to room. It has a reception range of 30 metres in open space from the electricity meter transmitter, less when passing through walls and in the vicinity of electrical appliances. 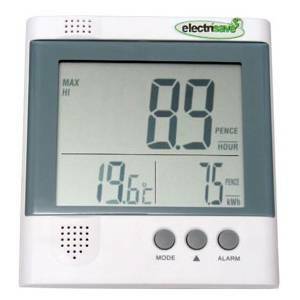 As an additional feature the display unit also displays the temperature and humidity of the location in which it is placed – helpful when deciding whether to turn or up down the central heating. A comprehensive REUK.co.uk Electrisave Review is now available. Click here. NEW – In 2007 Electrisave was discontinued and re-branded as Owl. 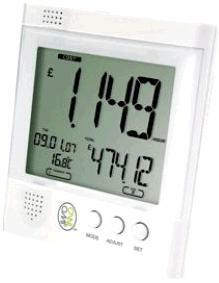 As of January 2009 the latest version is OWL CM119 (pictured above) – click here to read our article OWL CM119 Wireless Energy Monitor for more information and for purchasing information for this new improved (and cheaper) product.